Pilates helps to retrain your pattern of movements and posture, whilst improving your strength, flexibility, core, coordination and balance. Pilates helps to maintain body balance and alignment. 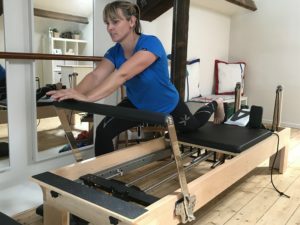 A wide range of people can benefit from pilates from the professional, to the sporting elite or for those just wanting to keep active. Clinical pilates uses a range of machines and floor based exercises to challenge your body in a controlled environment. Classes are small with only 4 people per class over 45 minutes. Every instructor is a qualified physiotherapist and will be able to keep a close eye on your technique due to the small class number.